Alex: There’s no denying that the eastern suburbs offer some of the best hotspots for cafe’s, restaurants and beaches in Sydney, if not Australia. There’s a definite vibe when visiting the east. It’s chilled, laid back, perhaps a little snooty according to B and V but who’s judging? It’s easily my favourite area just to people watch. And if you’re into people watching than ding ding ding… These three cafes are the perfect spot for a long brunch as you watch the world and every European car known to man, go by. Bake Bar is nestled in a new development of Double Bay, away from the prized hotspots on Bay, Knox and Cross street. This new area has got some great cafe competition including Bake Bar, Little Jean, Mistelle and About life and to be fair, each restaurant was just as busy as the other, which was rather refreshing to see. We squeezed onto a little table and ordered a round of coffee’s. I think each time I go to a cafe after 10.30, the desperation can be heard in my voice as I order my first coffee of the day. If I’ve not had a coffee about 8.00am I’m generally pretty poopy, word of warning. What I like about Bake Bar is that they don’t try to compete with anyone. The food is simple, with the focus obviously being the bread. They offer your standard breakfast foods but are done well without any unnecessary flowers or fairy floss etc which mostly just become a distraction. I ordered the Shakshuka – Mediterranean style eggs served in a homemade tomato salsa with herbs and spices $13.90 . The salsa was rich and bold with the egg remaining runny, which made it easier to dunk the bread in. I find that I now find it very difficult to eat eggs for breakfast so I’ll admit that I left those aside but the sauce was the perfect accompaniment to the bread at Bake Bar. We also ordered Avocado and Cherry tomato Bruschetta with feta cheese, kalamata olives, and zatar herbs $12.00. An addition that I hadn’t ever seen done before was the use of olives. I’m actually surprised that I haven’t seen this done before. The heavy flavour of the olives contrasted well with the velvety avocado. Definitely up there as one of the better versions of this dish that I’ve had. We also sampled a few of the tart desserts. Each tart had the same vanilla custard base but each was infused with different flavours including cherry and passion-fruit. It’s now up there as one of our faves due to the affordable pricing, great location, good coffee and a comfortable environment! And the fruit loaf is absolutely amazing, buy a loaf but go early! Vanessa: One sunny Saturday a few weeks back myself, Bianca and Mumma Squads, found ourselves at Harry’s, Bondi Beach. Clearly quite a popular destination with locals and tourists alike as the cafe was heaving when we arrived with a line formed out the door. This was a great indication of what we could expect, particularly given that the locals are spoilt for choice. 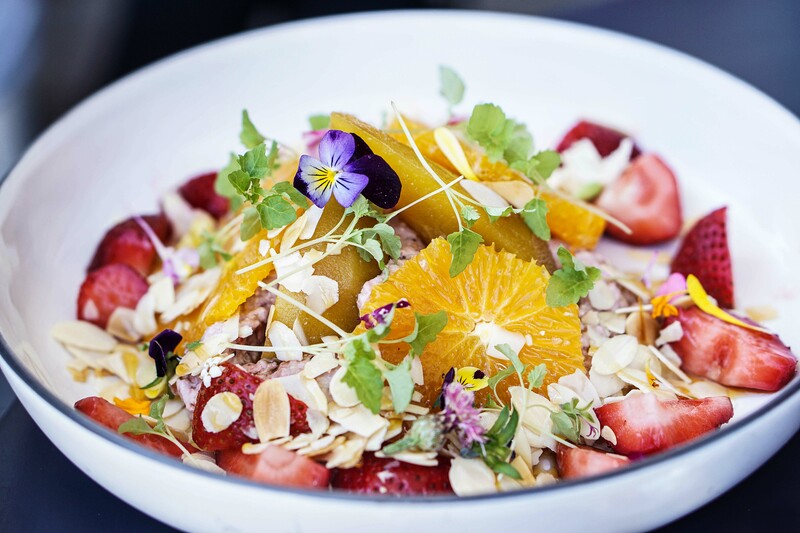 Harry’s is located at the northern end of Bondi Beach and boasts a menu that is packed full of locally sourced and predominantly organic produce. The cafe fit out is gorgeous and ticks every box when it comes to on-trend cafe styling from exposed brick to subway tiling to eye-catching pendant lighting, not to mention bearded baristas. After a little wait we were kindly accommodated with a table outside, perfect for people watching. The one thing I immediately notice are the beautiful people, predominantly donned in active wear, surrounding us. This made me wish I had put a little more thought into my ensemble that morning! We had decided to choose a mix of sweet and savoury from the menu to get a good sense of what Harry’s has on offer.I chose an option from the specials board of truffled asparagus served with a fried egg, prosciutto and parmesan. This was delicious if not a little bit on the heavy side. The flavour was strong and the combination of parmesan, truffle with just about anything goes, let alone my two of my favourites asparagus and prosciutto. This should be a regular staple on the menu, I imagine it would be a popular choice! Mumma Squads loves a bit of bircher muesli and as such could not resist the bircher muesli with fresh seasonal fruit and sliced almonds ($15.50). A delightfully refreshing dish that was both creamy and sweet from the bircher and slightly tart from the various fruits. A beautifully presented dish that had clearly taken some time to plate and present in such a way. Bianca opted for the quinoa and feta fritters served with fattoush, avocado, labna and hazelnut dukka ($19.50). This dish had a very middle eastern flavour quality to it and the fritters were perfectly crispy and delicious. The other elements complimented each other very well and there was a distinct refreshing taste to the dish created by fresh mint cucumber and tomatoes that offset the richness of the fritters. We also couldn’t resist trying the Insta-famous ricotta hotcakes ($17.50). The hotcake is served up with seasonal berries, organic maple, lemon balm and double cream. Visually this is an absolute feast for the eyes with vibrant colours from the berries and edible flowers. Unfortunately, we found the hotcake to be a little under-cooked which meant it had a rather unpleasant “eggy” flavour which was a bit of shame considering how amazing it looked. Alex has been many times to Harry’s and has never experienced this so will happily go back and order this again though, as I imagine it was a one-off. Harry’s certainly ticks the boxes if you are after a trendy cafe with a view, in a great location that offers a beautiful and inspiring menu. If you are a Bondi local, then consider yourself lucky to have Harry’s on your doorstep! Alex: Another frequented cafe is Indigo, which also lies in Double Bay. We visited in early 2015 for lunch https://forfoodssake.net/2015/02/16/indigo-double-bay/ so I won’t bore you again with the nitty gritty details but rather a quick summary of the famous breakfast options. First of all, they recently did a much-needed revamp of the cafe with some new furniture. The outside was always where you wanted to be seated but now the inside has some beautiful marble tables. The first of our top picks at Indigo is the French toast – maple bacon, raspberry jam, maple syrup, honeycomb, seasonal fruit & mascarpone $20. The french toast reminded me a lot of Panetone which we have often during Christmas time. It actually made me rather nostalgic! The addition of the fresh honeycomb on the top was a welcome touch. Unless your stomach can take it I wouldn’t recommend ordering this to yourself though. And literally just for the money shot, we had to order the stack of Pankcakes caramelised banana, maple syrup & vanilla whipped mascarpone $20. The pancake itself had a similar taste and texture to a doughnut. Light and fluffy and drowned in maple syrup. The presentation was great, simple and homely and the vanilla whipped mascarpone was a fresh accompaniment to another heavy dish. Some of our favourite cafes in the Eastern suburbs! If you’ve been to any of them let us know what you think! Curious what the rest of Sydney thinks about these places. *For Foods Sake dined as guests of Harry’s Bondi, Bake Bar Double Bay and Indigo Double Bay. All opinions however are our own.